Oh how my girls love dressing up. You should see their room! There are clothes strewn all over the floor. It is horrendous. They change a gazillion times a day. 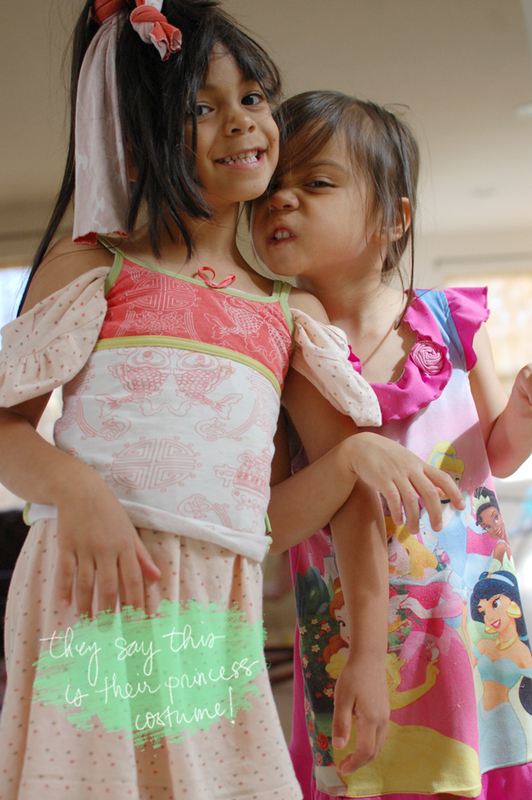 One minute it is for a birthday party, another for a wedding, next minute because they are princesses. At times, okay, most times, their messes are maddening, but at the same time I am glad they are having fun playing together and using their imagination. I remember having lots of fun doing these silly things as a kid too. I also remember my mom getting mad at me for not cleaning my room. Though I have to say, their dressing up and crazy room with clothes everywhere is kind of making me nervous for when they hit teenage years… oh boy! This particular outfit is their princess outfit. I think it’s kind of cute how True stole my shirt and layered it and it became a dress of sorts. And Brave is always wearing that dress. Always. I am sure you will see it about twenty more times in this space. I have hid it a number of times and somehow she always finds it and ends up wearing it. Oye! These cute little babouches, gifted from Maison Marrakech, are our house slippers. 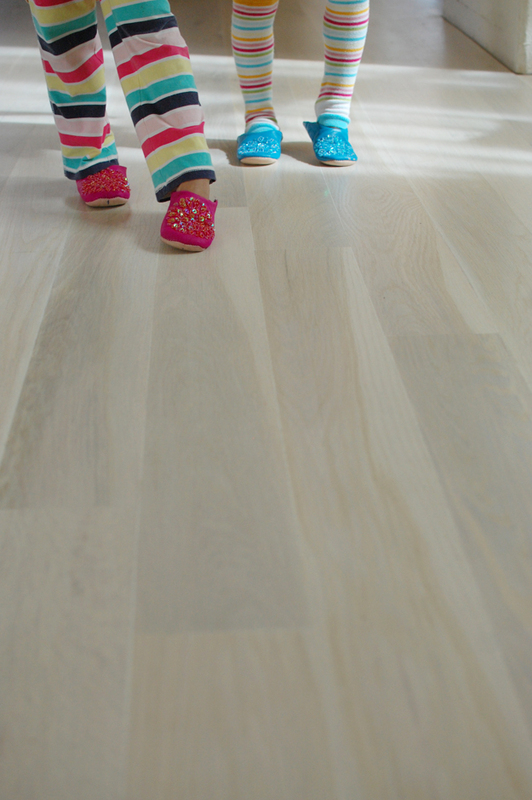 They were the first things we gave the girls once the wood floors came in. When I was little I remember I always had to wear slippers around the house because my mom said if I didn’t, I was going to grow a lot of veins on my feet. I really think that was one of her myths and legends kind of thing, and while I don’t think that is necessarily true, I do like it better when my girls wear some slippers on the hard wood floors. Plus, I got my own, mine are the white ones, and they really are so comfy to wear around. It’s an extra bonus that they are so pretty and funky! We usually do the no shoes in the house rule, but now that we have (whitewashed) wood floors, we especially try to keep to that. The girls know they have house slippers and outside shoes. Though my question is, how do you relay to visitors that we are a “no-shoes-inside” home? Any of you do the same rule? If so, I would love to hear how you handle visitors coming over. Oh, I love those slippers!! We are a no-shoes inside family most of the time, though I don't normally enforce it for guests. Often, though, just the sight of our shoes lined up by the front door is enough to prompt guests to remove theirs! 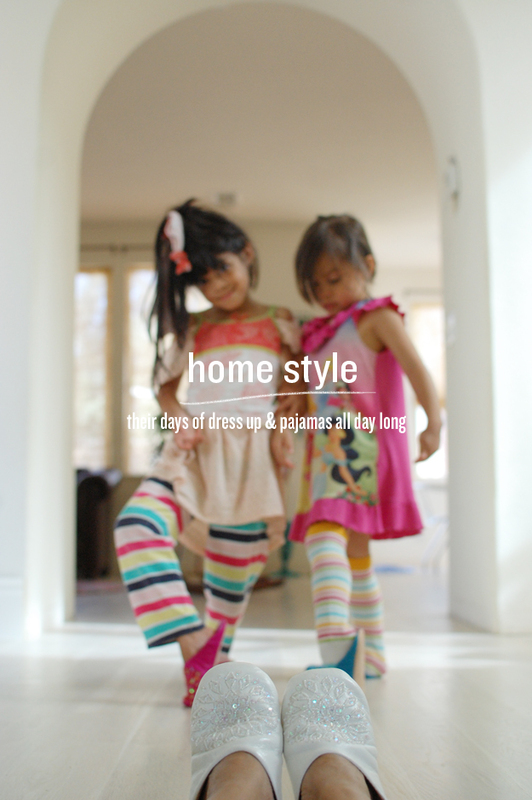 Looks like you're having an awesome summer in your house slippers and pajamas! Martha Stewart has a no shoes policy in her house. She keeps a basket of non-skid slipper socks by the door for guests. You must enforce that rule! We had a party for new year's and some friends of friends came over. One girl wore stiletto boots and you could see everywhere she walked in our house that night on our year old wood floors. I cried a little the next day. I went to a house once with a no shoe rule (we do that too so I already take them off just inside the door). I was wearing boots that would take a minute to get off and the older man whose home it was said in a loud booming voice, “I don't know what you do in your home but here we shed our street shoes when we come in the door… do you understand?” All I could think of was, Wow… surely there is a nicer way to say that to guests. I like the basket by the door idea. Or even just a friendly, “Do you mind slipping off your shoes?” I would not have minded that at all ;). Your floors look lovely!! A pet peeve of mine is people walking in my house with their shoes on. I am constantly on my husband about it because it grosses me out. Who knows what you've walked through outside! Anyway, I always feel awkward asking guests to take their shoes off. Some people catch on because our shoes are piled by the door, but I think because we have hardwood floors, more people feel like they don't need to take their shoes off (versus carpeted floors). I grew up with a no shoes in the house rule. So I have done the same. My kids know to take off their shoes in other peoples houses and do it without thinking. When my kids were younger they would tell people who happened to come in with shoes on that they needed to take them off. A little embarrassing but secretly I liked it :). They still tell their friends. You could have a sign or plack. My sister in law has a cute wooded plack that says something like “Please remove your shoes” right where you can see it when you walk in. A lot of people see that we aren't wearing shoes and will ask if they want me to have them take theirs off. My only exception is my grandparents. I am lucky enough to still have them around and they come to birthday's. But they aren't usually running around my house and it's hard enough for them to get around, let alone bend over to take their shoes off. (They are in their late 70's) I think asking people if they could please remove their shoes is okay. It's your house and I think most people are happy to respect your house rules. We don't wear shoes in our house and I too have a basket of all sorts of slippers and cool socks. Everyone usually know our “No Shoes” rule but if not I make it hubby's job to ask them to remove their shoes! We have all our shoes in the foyer, and most guests put 2 and 2 together, although there are some that we politely ask (usually the kid) and as the parent walks in seeing their child taking off their shoes, they get the hint. I have also just politely asked if they mind, due to the fact that we have a baby/toddler/kids playing directly on the floor. Plus I tell them it's more comfy anyway–part of making yourself at home! I feel a little awkward too about asking people to take shoes off, but have discovered that if you can manage to meet people outside your home (so you have shoes on too), when you come in and remove your own shoes your guests catch on more often. I think it's because they are sort of stuck near the front door for a second while you slip off your shoes, they think before just walking in. Maybe you can send the girls out to be a “welcoming committee”! I have alway felt a little strange asking guest to take their shoes off, and I usually like to take my shoes off at my own home and at close friends house out of comfort (easier to curl up and talk on the couch). I think that there are times when it is ok to ask people to remove their shoes but others where it is not. In a casual setting to someone who has come over a lot of times I think it is totally appropriate to do and close friends would understand, but if it is a party and you invited them, esp one where people are dressing up, and even more so if it is dressy enough for stocking feet (nylons) I think that it is off-putting to ask guest to take them off because I know when I am dressed up nicely that taking my shoes off and standing in my dress barefooted or in slippers feels really strange. So I kinda just like to go with the rule of whatever makes my guest feel more comfortable in my home, if they like to take their shoes off then they can feel free to (which a lot of people ask when they enter our house because they see our shoes lined up by the door) but I always tell them to do whatever they prefer, because I invited them over and I care more about their company and comfort then my floors. totally agree when it is a nice dress up party that is kind of strange to. i would feel standing in nylons too. i think my main concern is that i still have a baby crawling all over the ground and putting her hands in her mouth, but i don't know where people's shoes have been. i know, i am kind of neurotic that way. i definitely agree with you though, that sometimes it is a case by case basis and depending who is over. i have had people ask, “do we need to take off our shoes.” and i replied, “i prefer it,” but then they said, “oh but it will take us so long to take off and put back on.” lol. i think it is funny they asked, but then didn't really want to do what i preferred! I'm a Canadian and we are all no-shoes-in-the-house people. No one would ever walk into a house and leave their shoes on! I wonder why we are so different? Maybe because of our 4 seasons? But I didn't say anything, because I guess that's the norm. I just always think it's funny how different us Canadians and Americans are from each other- even though we're neighbors! p.s. your floors are amazing. We have dark floors and four children and a dog. Every speck of dust/dirt/hair shows up. I would die for white floors! I'm Canadian too and it's appears to be a non-issue. Every home I've been to has been shoes-off. I find sometimes older people, like my grandfather and boyfriends father find taking their shoes off is a hassle if they're just coming in for a minute, so I leave them be. But if I had kids crawling around on the floor I would definitely ask them politely to remove them. No biggie! That's my daughter every morning. All the colors of the rainbow and every piece of clothing she owns. I live in Poland and every house is a no-shoe house. Often times when you visit someone they will offer you a pair of slippers to put on. Since I moved from Florida, where I never owned slippers, it was strange for me at first, but now I think its great. You feel cozy and relaxed in slippers. Not sure if it would be too strange of an offer where you live.. ! I've never known a shoes-inside family in Austria my entire life, we all have a no-shoes-inside rule – probably because there is a lot of snow for a while each year. Most people you visit around here have a big pile of “guest slippers” to hand out to anyone who comes. I guess a pile of shoes at the door is also an indication to take your shoes off 🙂 I take mine off out of comfort most places, makes me feel at home in an instant. i live in costa rica and they live in their shoes here. i have no idea how they think that's comfortable. the ask me all the time if my feet hurt from wearing no shoes. they actually are disgusted that gringos take their shoes off at other peoples homes. i laugh in my head because they don't know what they're missing out on. as far as the clean factor, they are cleaning beasts and their floors are always spotless. i just perfer to keep the mess by the door. Your guest is exactly that- your guest. They should not be expected to take off their shoes and wear something from your public use basket of socks or slippers. Many guests will offer or sometimes automatically remove their shoes but I think it's rude to tell them to do it the minute they walk in your door. I live in Canada and I can say that everyone I know take their shoes off when they enter someone's home, it's respect and it's the norm here…but if I see the host and other guests with their shoes I still will ask if it's okay to keep them on. I think it's perfectly fine to ask guest to take their shoes off. If you have no shoes on, it's shoes off! My mom is from Hawaii and there it is almost disrespectful to leave your shoes on in someone's home. You'll almost always see a pile of slippers (flip flops) by the door. It's funny because at our old place everyone knew to remove their shoes as we had a rack with our shoes outside on the porch. Now that we are living in a home with hardwood floors the same people assume they can wear there shoes. I always feel awkward about asking people to remove them but at the same time I know I would be happy to comply with someone else's wishes in their home. I have a 7 month old who has been crawling around for the last 1 1/2 months so I usually just greet people at the door, open our entry closet (it has shoe racks) and let them know them can put their shoes in there (otherwise my son will try to eat them). If they don't hear or forget I just say something to the effect of, “Would you mind taking off your shoes since Forrest is crawling on the ground? Thanks” The only people who ever complain are a few close friends 🙂 and that's on purpose. Just know that even my siblings forget to take off their shoes…there is something about hardwood floors that makes me people think its ok to wear shoes in the house. But I agree, I don't like my baby crawling around on/putting things in their mouths that have touched the floor where shoes have been. A lot of people suggested a basket by the door, but I didn't read anything about a bench or a chair. Some people wear more complicated shoes to put on or take off or are not as dexterous as you may be. My mom has a heck of a time at my in laws who have a no shoe house because she wears her sneakers tied tight and usually takes her shoes off while she is sitting on the couch. Also, they just recently started putting out slippers, but they are all the free ones from hotels. They are super slick on tile and wood and are all one size, so it can get dangerous walking around. Slippers are a great idea, just make sure they have a non skid sole. We are a no shoe household too, but we not yet set up a system for guests, so we never enforce it. We have a basket by our front door for people to put their shoes in even though we don't have a rule about no shoes. I did have a friend who had a bench by their door & would ask people to leave their shoes at the bench & they had slippers for guests to put on if they wanted. It was so thoughtful of them especially in the winter months when our piggies might get a little chilly. I can think of few things more rude than having someone push a new visitor into taking off their shoes when they would really rather not. What if their feet stink or they have foot issues? My dad wears prosthetic legs and taking his shoes on and off takes quite a bit of effort, not to mention a shoe horn. No one knows he's missing his feet unless he's wearing shorts. If the guest is there for a tour of your house, I think it's fine to ask them to remove shoes but if they are not going further than the front room or kitchen, I think it's up to the visitor. We are renters with carpet (cry), but everyone I know who has a no shoes policy normally has either a line of shoes or a basket of shoes and people (considerate people) get the hint when they walk in. I think it's totally acceptable to politely ask them to though. Maybe you should have a pair of shoes for each person sitting by the door, so guests see that you are a shoes off household? The slippers idea is nice but I don't think I would like wearing slippers that someone else has before… Maybe that's just me! I'm filipino, so it's a cultural norm for people to take shoes off when entering someone's home. ben didn't grow up like that, but has adopted that habit as well. his mom and sister have feet problems, which we completely understand, so when they come visit they have to wear shoes on our floors. i think you have to feel out different visitors, but i do definitely lean towards no shoes from all, if possible, but understand with certain situations completely. i think especially since we have a baby crawling all over the floor, i definitely prefer shoes out. i do have slippers by the door if someone wants to use them, but i don't mind bare feet as well. i think culture plays a role and no one way is better than the other, but it all comes down to preference and doing our best to understand others. my preference is no shoes, but i could understand how some would feel uncomfortable with bare feet. usually though, i ask if shoes are allowed in the home or not. i think it's a cultural thing. I grew up in Indonesia and every one wears slippers at home because most of the houses are tiles or marbles. No carpet, oy! So it's pretty common to see an Indonesian house full of shoes/sandals/boots outside the door when there's a party. People all dress up with no shoes. Haha. many of our friends, actually Asian families come to think of it, have a no shoes in the house rule. They usually just ask that we remove shoes (if it's our first time visiting) when we come in the door, and have a basket near the entry for shoes or tell me where I can put my shoes. I've never been bothered by being asked to remove my shoes. I actually think it's a nice, clean habit! Love your cute girls' fashion sense. So colorful! ha! this is so my house! 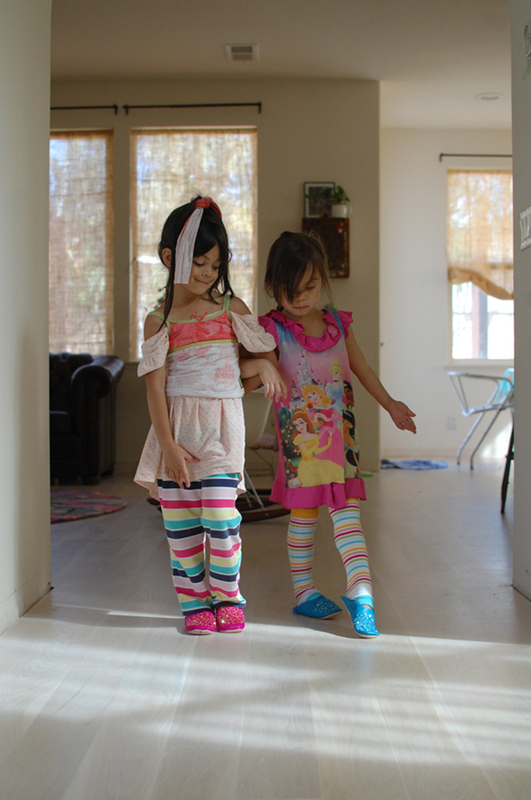 i have three girls… and although my oldest is now in 2nd grade, my 5 and 2 year old still dress up lots. especially my 2 year old. change, and change and CHANGE again! and throw your clothes ALL over the floor, why don't you?! and they just end up putting it all in the laundry bin. We prefer “no shoes” in our home, but we always ask guests to “make themselves comfortable.” Some remove shoes, and some don't — either way is fine, as long as they are comfortable. My best recommendation, especially during cooler months: provide a lovely basket of soft, cute and inexpensive socks in both white and fun colors, and have those at the door for guests to slip on. Bonus! They can take them home if they want. I love all the suggestions here. We tried to be a shoes-off house but got tired of reminding our family/friends over and over again. We eventually accepted that we'd just have to clean the floors after everyone leaves (just the kitchen/living room/bathroom probably). I am shocked that some people would walk right in with wet shoes, not even wiping them on our door mat very well and leave wet/muddy footprints on our chocolate brown wood floors. We're living with my parents right now and they're a shoes-on house. I've gotten so used to it! There floors are always just dirty enough that barefoot is uncomfortable. When our new house is finished being built, maybe we can try the shoes-off policy again and hope guests catch on this time. There's not that many “shoes in house” types that I know. Even in daycares around here (Toronto Canada), children need inside and outside shoes. I would leave a basket of cute, cozy slippers by the door and ask your guests to use one. Those slippers are very very cute. When guest come we don't ask them to remove their shoes. Our carpet is old so it is no big deal. When we do have a new flooring we will ask them to remove their shoes but it is all depending what kind of flooring though. Yes, I agree in every culture it is different. Also I think it is depending what kind of flooring you have. I know a couple who had white carpet and they didn't care if people have shoes or not and I have no idea how they maintain it is so spotless. My husband and I still joke about that incident and we did ask them how they maintain it all these years. I think it is all depending on the situation. My husband have no problem walking bare-feet but for me to walk bare feet in someone's house will make me feel uncomfortable. If they provide me with slippers great but I will rather walk with my socks on. Also if your floor is brand new & the color of the floor I assume your guest will have some common sense. we are also “no-shoe-in-the-house-” kinda people. Most of our visitors see our shoes at the front door and ask or just feel the liberty to take their shoes off also! We've never been a shoes-off family, but we've had several friends who are, and we never mind taking ours off. However, since floors are sometimes cold (or feet are sometimes dirty – especially if you've been wearing sandals and you live in a dusty area), providing inexpensive socks or flip flops is a nice idea to make your guests feel welcome while still protecting your home.